Although californium does not occur naturally on Earth, its electromagnetic emissions are regularly observed in the spectra of supernovae. Difficult to produce on a large scale, californium has been used in radiography of aircraft materials to detect metal fatigue. It has also been used in the treatment of certain cervical and brain cancers where other radiation therapy is ineffective. This man-made element is named after the state of California and the University of California, Berkeley, where it was discovered. 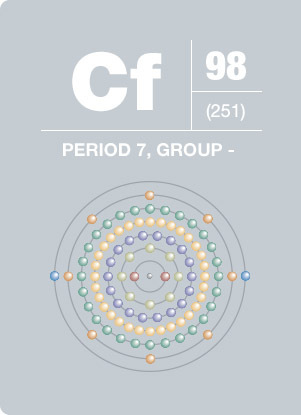 Recently, it was announced that californium had been bombarded with calcium ions to produce ununoctium (atomic number 118).